Most people know that the human body can go only a matter of minutes without oxygen. However, equally as important, your body must get rid of potentially toxic carbon dioxide. These vital functions are taken care of, in part, by your respiratory system. The respiratory system works together with the circulatory system to deliver oxygen to your cells and to rid the cells of your body from carbon dioxide. The respiratory system and the circulatory system work so closely together that they are often referred to as one system called the cardiovascular system. The word "cardio" means "with air" and the word "vascular" refers to the vessels of the circulatory system. 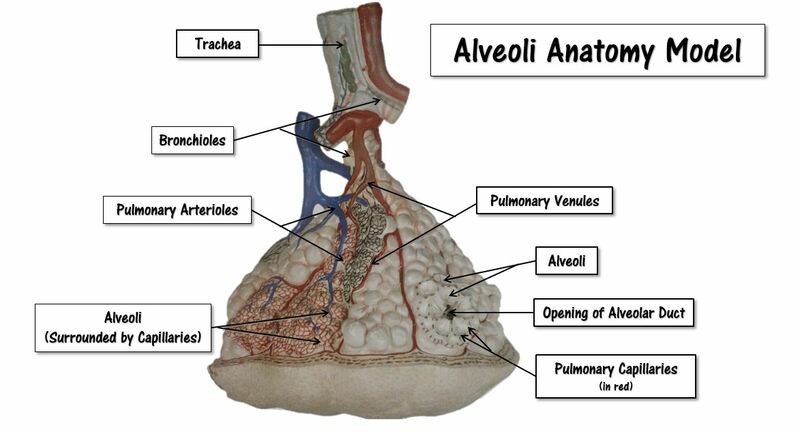 The Airways - The function of the airways are to carry air between the lungs and the body’s exterior. The Lungs - The lungs are the functional units of the respiratory system. The lungs function to allow the passage of oxygen into the body and carbon dioxide out of the body. Muscles of Respiration​ - The muscles of respiration include the diaphragm and the intercostal muscles. The muscles of respiration function as a pump expand and collapse the lungs which forces air into and out of the lungs during breathing. Respiration begins with air entering the airways through the nasal cavity and the oral cavity (the mouth). The nasal cavity contains the nasal conchae, which contains several thin, scroll-shaped bony passages which function to increase the surface area of the nasal cavity. The nasal conchae function to warm and moisten the air we breath before it reaches the lungs. The nasal cavity is lined with hairs and sticky mucus that act to filter out some of the unwanted particles of the air such as allergens and viruses. The throat is called the pharynx. 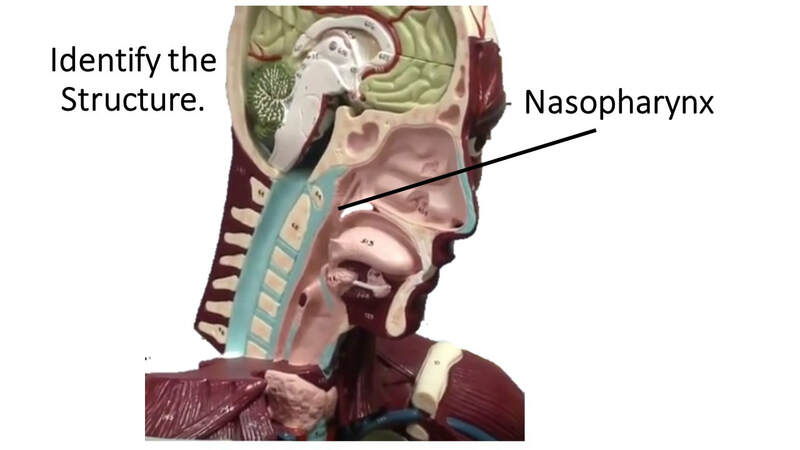 ​the nasopharynx, the oropharynx and the laryngopharynx. The pharynx colloquially known as the throat. The larynx lie behind the oral and nasal cavities and and connects to the esophagus and the larynx. The pharynx is part of the digestive system and the respiratory system. In the respiratory system, The pharynx acts as an airway, along with the other structures of what is called "the conducting zone". The conducting zone includes the pharynx, the oral and nasal cavities, the larynx, trachea, bronchi, and bronchioles. These structures act as filters that warm and moisten air. 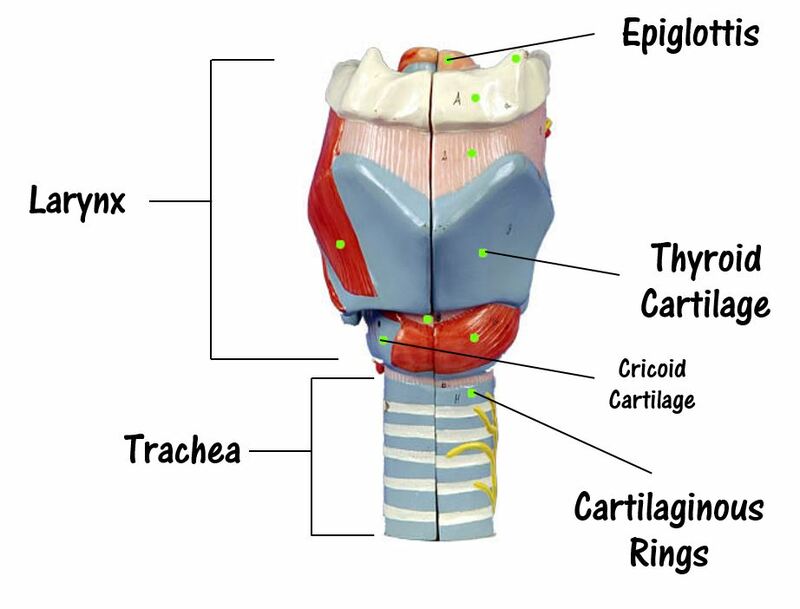 The larynx (voice box) connects the laryngopharynx to the trachea. The larynx begins with the epiglottis. The epiglottis functions to cover the larynx during swallowing to prevent food from entering the airway. ​ The thyroid cartilage protects and surrounds the vocal cords. Inferior to the thyroid cartilage is the ring-shaped cricoid cartilage which holds the larynx open. 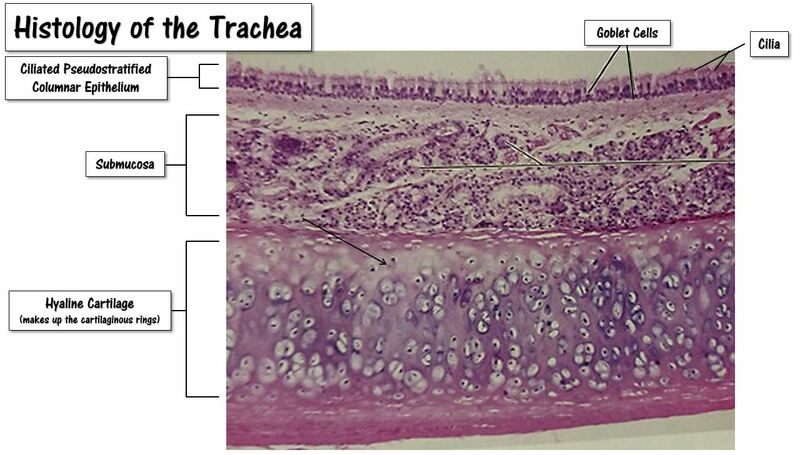 The trachea functions to provide a clear airway for air to enter and exit the lungs.The trachea (windpipe) is a tube of cartilaginous rings lined with ciliated pseudostratified columnar epithelium. The ciliated pseudostratified columnar epithelium contains cilia which act to traps unwanted particles like dust and other contaminants and prevents them from reaching the lungs. In addition to the cilia, this epithelium also has a number of goblet cells which function to secrete mucous. The mucous assists the cilia in trapping unwanted particles to prevent them from entering the lungs. ​The glottis is defined as the opening between the vocal cords. 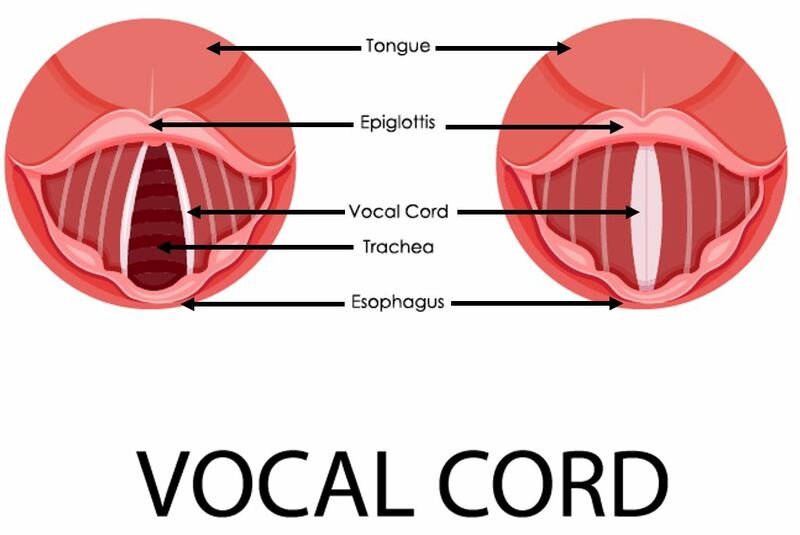 The vocal cords function is to vibrate, producing different vocalizations used for communication. 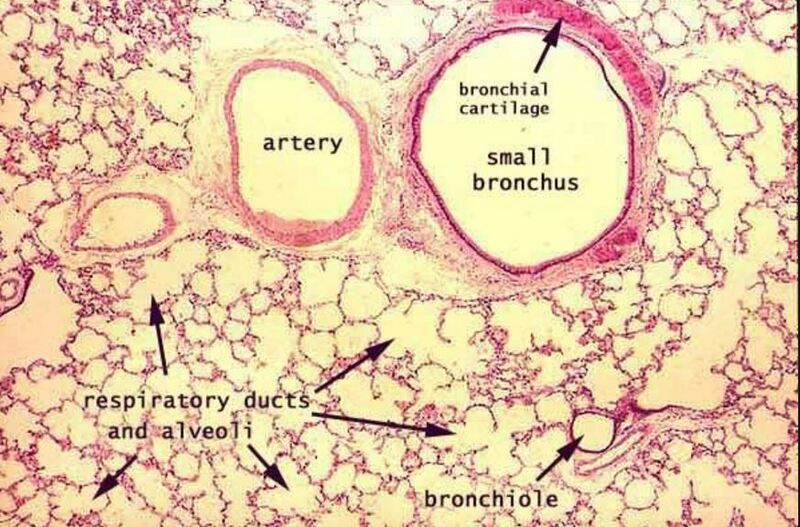 The function of the lungs in to house the smaller branches of the bronchial tree (from the secondary bronchi to the bronchioles). The trachea diverges inferiorly to form the primary bronchi. 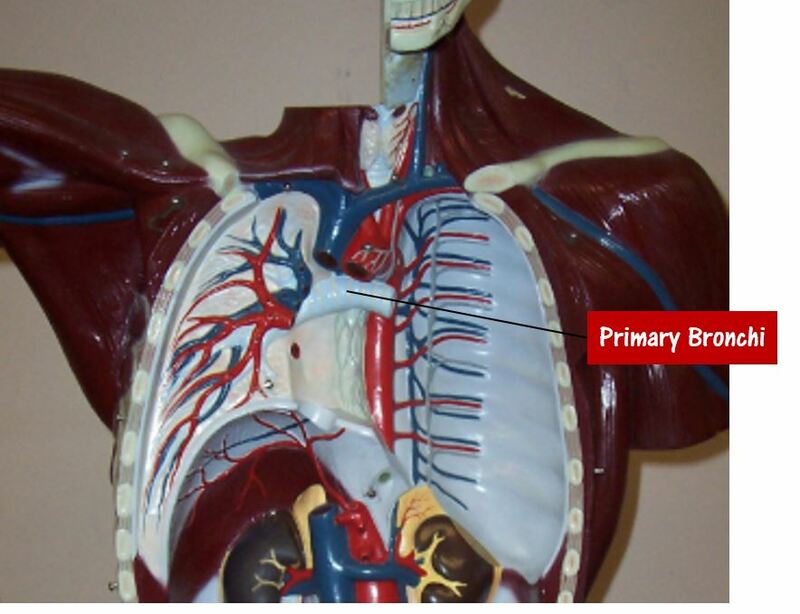 The primary bronchi continue to branch to form the secondary and tertiary bronchi and so on. The smallest fine branches of the bronchial tree are the bronchioles. 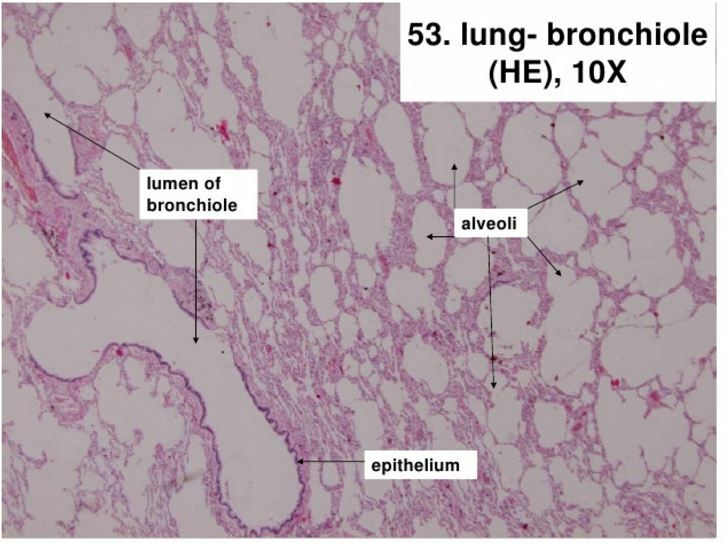 followed by the fine branches of the bronchioles and terminal bronchioles, which funnel air into the alveoli of the lungs. 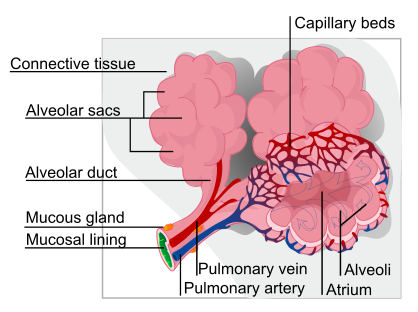 The alveoli are lined with thin simple squamous epithelium that allows air entering the alveoli to exchange its gases with the blood passing through the capillaries. 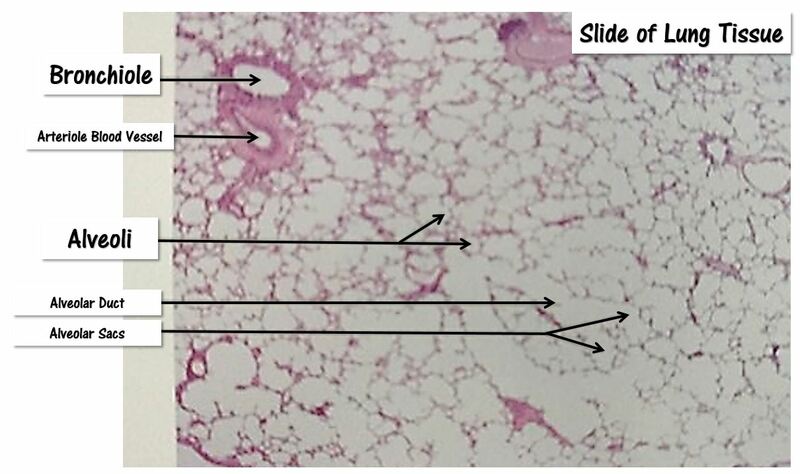 The alveoli function as the main sites of gas exchange. The lungs lie on either side of the heart superior to the diaphragm. The lungs are surrounded by the visceral pleura that allows space for expansion. The parietal pleura is the outer membrane which is attached to the inner surface of the thoracic cavity. It also separates the pleural cavity from the mediastinum. ​The left lung is slightly smaller than the right lung to make room for the heart. The left lung only has 2 lobes, while the right lung has 3. The bronchioles are the narrowest airways of the lungs. 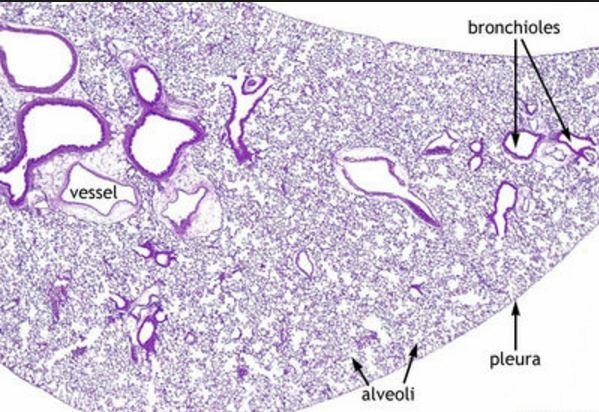 The bronchioles function to deliver air to the alveoli, where gas exchange occurs. 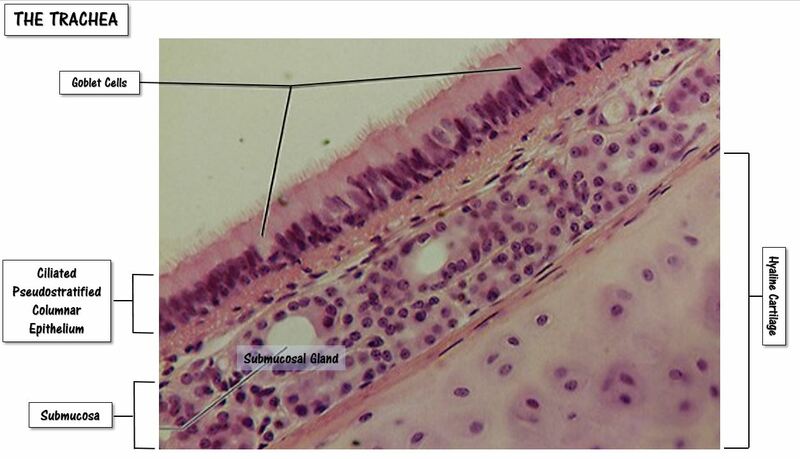 The bronchioles are lined by simple ciliated columnar epithelium, and the trachea is lined with ciliated pseudostratified columnar epithelium. 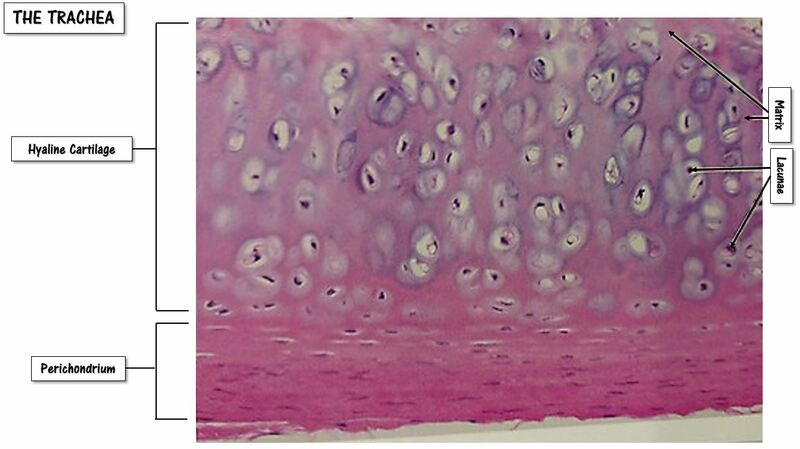 Both of these epithelia also contain goblet cells which produce mucous. 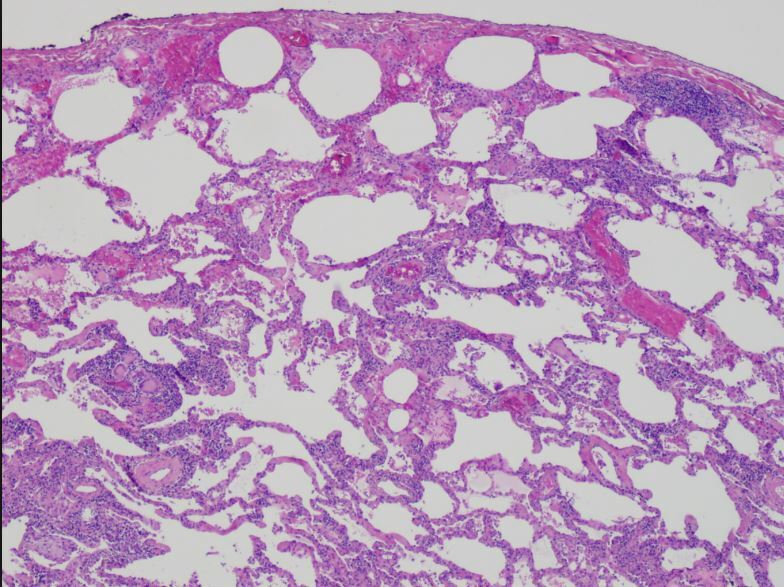 The trachea is lined with ciliated pseudostratified columnar epithelium, whereas the bronchioles are lined by simple ciliated columnar epithelium. Both of these epithelia also contain goblet cells which produce mucous. The diaphragm is a muscle that lies below the lungs that separates the thoracic cavity from the abdominal cavity and functions to force air into and out of the lungs, along with the intercostal muscles. The diaphragm is the main muscle of respiration. When the diaphragm contracts, it moves down (inferiorly) inches into the abdominal cavity. When thus occurs, the area inside of the lungs gets larger (the lungs expand) which pulls air into the lungs passively through simple diffusion. In a similar manner, when the diaphragm relaxes, the lungs shrink and air is expelled out of the lungs. The external and internal intercostal muscles lie between the ribs and function to assist the diaphragm with expanding and compressing the lungs during respiration. Contraction of the external intercostal muscles elevates the ribs to increase the volume of the thoracic cavity which assists inhalation. The internal intercostal muscles function in the opposite manner; they relax during inhalation and contract during forceful exhalation.